Miniature, Waterclor on vellum, 4.5 cm. (diameter), Private Collection, UK. 1774 Description: Within the cabinet of enamels and miniatures…Catharine Parr; by Holbein: a most scarce head, and exactly like the picture of her at the earl of Denbigh’s at Nuneham Padox, Warwickshire (83). 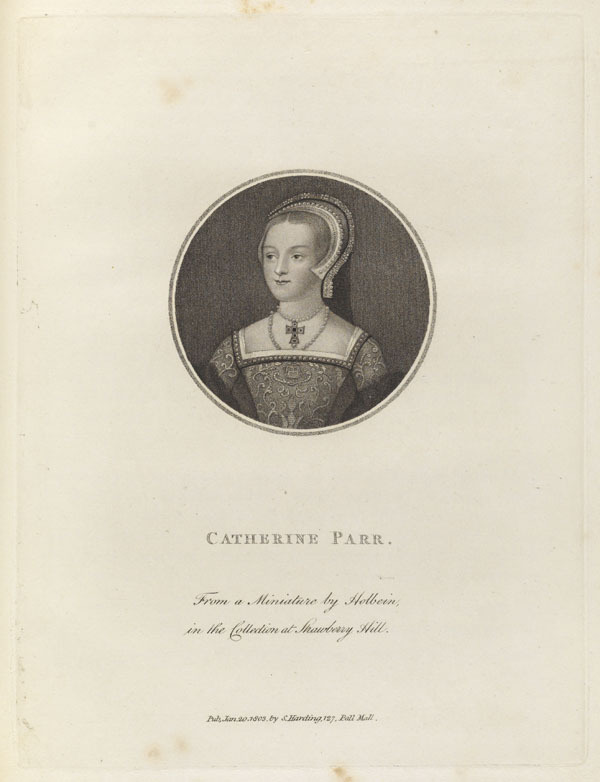 Sale Text: An equally fine miniature of Catherine Parr, by Holbein, a very rare and original Portrait of this the last queen of King Henry VIII. Provenance: Horace Walpole; 1842, May 10, Strawberry Hill Sale, Day 14, Lot 69, John Dent, Esq., £10.10.0. Bibliography: HW Corres 34:208 The Biographical Mirrour, (London: S. and E. Harding, 1785), pp. 36-40.